Nate Diaz was born as Nathan Donald Diaz on the 16th April 1985 in Stockton, California, USA. He is best known for being a professional mixed martial artist, who competed in boxing and Brazilian Jiu Jitsu for the Ultimate Fighting Championship (UFC) in the Lightweight and Welterweight divisions and is the winner of The Ultimate Fighter 5. His career has been active since 2004. Have you ever how rich Nate Diaz is? Sources estimate that Nate’s net worth is $700,000 as of early 2016, with the main source of this amount of money being, of course, his career as a mixed martial artist. Additional to this, he has appeared in a documentary movie which has also added to his net worth. Another source of his wealth is coming from the school run by himself and his brother. There is little doubt that Nate’s net worth will become higher as he successfully continues his career in sport and other activities. Nate Diaz was raised in California, with his older brother Nicolas Robert “Nick” Diaz, who is also a mixed martial artist and former Strikeforce Welterweight Champion and WEC Welterweight Champion. Under the influence of his brother, Nate decided to make a career in the same sport, but before that he attended Tokay High School, and when he was 14 years old started training with Nick. After graduation, they together founded a Brazilian Jiu Jitscu school in their hometown, and Nate became a student at the Plaza Robles Continuation High in Stockton. Nate Diaz’s professional career as a mixed martial artist began in 2004, but his first title came in 2007, winning the fifth season of the Ultimate Fighter, which featured only lightweight fighters. On his way to the title, Nate defeated fighters such as Rob Emerson, Corey Hill, Gray Maynard, and in the finals Manvel Gamburyan. Afterwards, he joined the Ultimate Fighting Championship (UFC), and slowly built his career, and also his net worth. Currently, he is 7th fighter overall in official UFC lightweight rankings. Nate has a current record of 18 wins and 10 losses, and some of those wins include accomplishments such as Submission Of The Night five times, against fighters Alvin Robinson, Melvin Guillard, Takanori Gomi, Kurt Pellegrino, and Jim Miller, then Knockout of the Night, against Gray Maynard. Furthermore, he has six times Fight Of The Night, against such fighters as, Clay Guida, Marcus Davis, Michael Johnson, Donald Cerrone, Joe Stevenson, and Alvin Robinson. His net worth has increased during his career mostly because of the contracts he has signed with fighting leagues, and on account of that he fought in WEC, Strikeforce, as well Pancrase, which is held in Japan. To speak further of his accomplishments, he is 8th on the list of most Career Submission Attempts with 20, and he is in the second spot of the most wins by submission, of which he has eight, and is tied with fighters Frank Mir and Kenny Florian. Nate also holds 2nd place for the most Post-Fights Bonus Awards, with 12 of them. 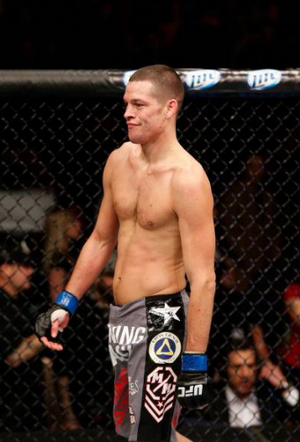 Additional to his career, Nate Diaz appeared in the documentary on the sport of mixed martial arts, entitled “Fight Life”, alongside his brother Nick Diaz, Gilbert Melendez, and Jake Shields. The film was directed by James Z. Fend and released in 2013; it has won the United Film Festival award in the category of Best Documentary. This also added to his overall net worth. When it comes to Nate Diaz’s personal life, he keeps it very private, except for the fact that he still lives in Stockton, California, and in his free time enjoys listening to Led Zeppelin and Eminem.